Strathbogie Forest & Gardens open day in May was a great success and 3 months later the orders are still coming in. 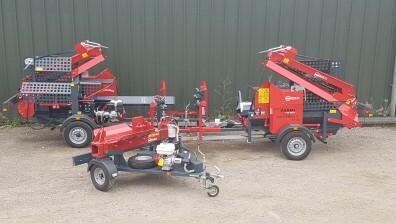 The latest shipment was for two of the very popular Farmi WP36 road tow firewood processors along with a road tow Split0-Fire 4403 log splitter. Both the Farmi processors were with 10-ton splitting force. The Split-fire 4403 has 32ton two-way splitting. If you have never tried a Split-Fire log splitter then you simply wont have experienced just how great these splitters are. The proof is in the trying so why not get in touch with Riko to arrange a demonstration. If you are in the Aberdeen area then why not give Pete at Strathbogie Forest & garden a call.